Create wonderful birthday memories with a Plush Birthday Bear! 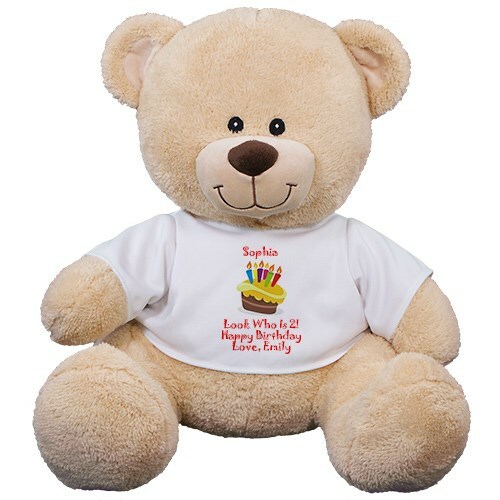 This stuffed Happy Birthday Teddy Bear is truly one-of-a-kind because you can custom design the t-shirt with any four line custom message. The personalized t-shirt is featured on our Sherman Teddy Bear. Sherman is available in three different sizes. Please choose from our 11 inch, 17 inch or our 21 inch teddy bear. Free gift wrapping and a free gift message are included to create a thoughtful presentation. I sent the bear to my granddaughter and when I went to visit her I saw the bear. I thought it was cute and good quality. She loved it and especially loved the personalization. Additional Details Shop Plush Birthday Animals for any birthday celebration! We have gathered the most popular Birthday Plush Animals for you and your loved one's to enjoy.